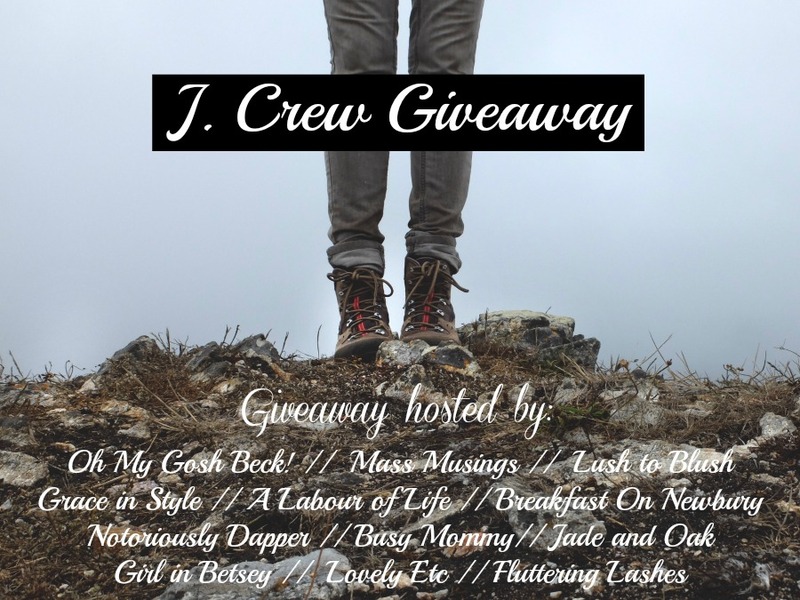 Grace in Style: J.CREW GIFT CARD GIVEAWAY!! Friends! New & old! I'm so excited to be co-hosting my first giveaway! I've been trying to think of ways I could say THANK YOU for all your love and support of this space. And this is just one very small way to say it! I've teamed up with some fellow bloggers to create a giveaway with an amazing prize for one lucky reader!! We're giving away a $250 gift card to J.Crew! You can enter daily until Friday, 10/17 and earn bonus entries by sharing this giveaway to friends on social media! J.Crew is one of my favorite stores to find classic well-made pieces that are staples in my closet for both everyday and work. I'm loving the trends in their collection this season. For the ladies, patterns are everywhere, especially florals, plaids and animal prints. For the guys, it's all about sweater weather; from cardigans to crew necks to shawl collars, they all look great on guys. I also love chambray shirts for guys in the fall paired with a fitted herringbone blazer. Rules: Use the Rafflecopter form to enter daily. Giveaway ends 10/17 and is open worldwide. one good thing that happened today was that it was pay day!! Thanks so much Ashley!! Good luck!! I hope it's a good one! Good luck! Me too!! Thanks! Good luck! My husband made me breakfast! I got my nails done today. Keep up the daily entries to increase your chances! Good luck! I spent a lot of time on my patio - 70 degrees - beautiful day!! !!! That is a perfect day! Get in that Vitamin D! Good luck! The very best! Good luck! Yay! Good luck! Enter daily for extra entries and chances to win!! A wonderful sunny day today. I got my Sephora order in the mail. I got my stitches out today!!! I ate lunch outside with my toddler and we watched butterflies! My dog modelled his Halloween costume for me. I got to see my daughter cheer during the pep rally for homecoming. I was able to stay home all day long and not have to go anywhere. Its been an awful week.. Baby daddy drama.. Car broke.. Mechanic said it would be over 600$ to fix .. Had to tow it elsewhere .. Cheaper place.. Thank god for AAA ! Power shutoff notice .. Rent is not paid..got stranded today for over an hour.. Its not been a good week at all.. But things are starting to look up .. After almost week without a car it should be done tomorrow.. I have an interview Thursday .. Which will hopefully lead to a job so I won't lose my place .. A friend of mine gave me 20$ so I could pay the electric company tomorrow.. And my bestie came and got me and my daughter today when we were without a ride. Although the mail not running today really messes other things up.. But I'm trying to stay positive.. They say god does not give you more then you can handle.. Well I'm about to break... So I hope god decided I need a break or a few real soon.. If you pray.. Please pray for me and my little girl. We need it. Badly. I got called for a job interview tomorrow. it's not my dream job, but it's a job which I really need right now! I got my car back from the shop ! Still not running great but he runs !! Yay ! Got the last part of my electric bill paid so my power don't get shut off .. Thanks to a friend ! Got some important results.. That I've been waiting for for far to long.. It's a shock but better in the long run.. If things work out. Today I had dinner with my husband...it was great!